Here on Planet Roadburn, we’ve always welcomed visitors of a cosmic sort. While this often means the wildest fringes of psychedelic rock, it also means the asteroid-riding, hazy new wave of Californian duo Drab Majesty is in perfect universal alignment with the festival. 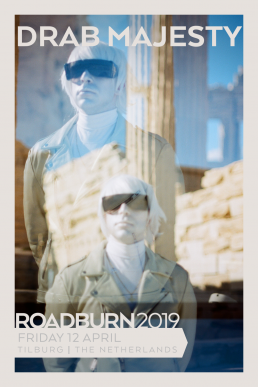 Drab Majesty began as a home recording project for former Marriages drummer Andrew Clinco but quickly became its own entity, warranting the need for his alter ego Deb Demure to take the forefront as guitarist, vocalist, and mastermind. With synthesizer accompaniment from Mona D, Demure guides audiences through a show that is truly beyond time and space, functioning as more of a setting for altered states and new experience than a mere recital of songs from records. Still, the records themselves are nothing to scoff at. While Careless was akin to Roxy Music‘s most slyly subversive moments through a modern lens, 2017‘s The Demonstration saw Drab Majesty becoming more electronic and exploring suicide cults, space, and other areas that defy easy comprehension.